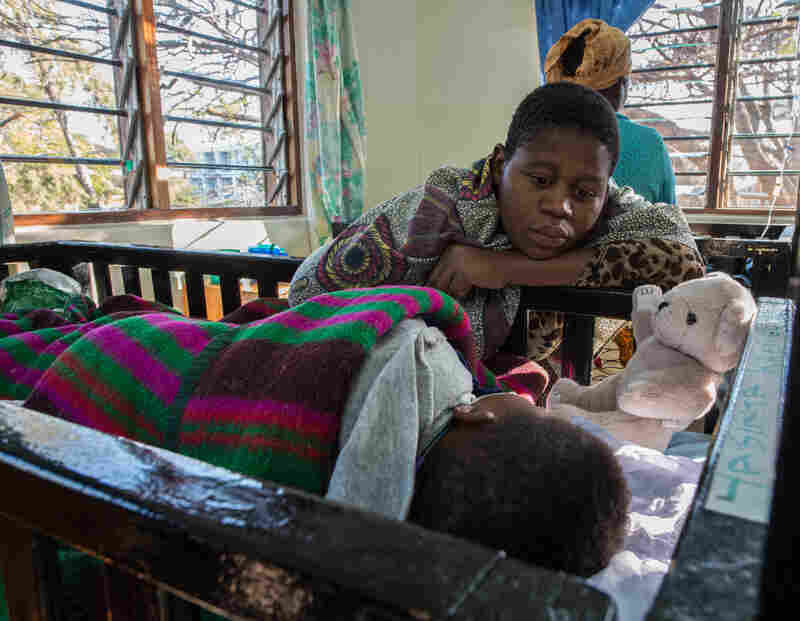 How Malaria In The Brain Kills: Doctors Solve A Medical Mystery : Goats and Soda A child stricken with the deadliest form of the disease can quickly fall unconscious and die. A doctor in Michigan has dedicated her life to figuring out how this happens. At last, she has the answer. 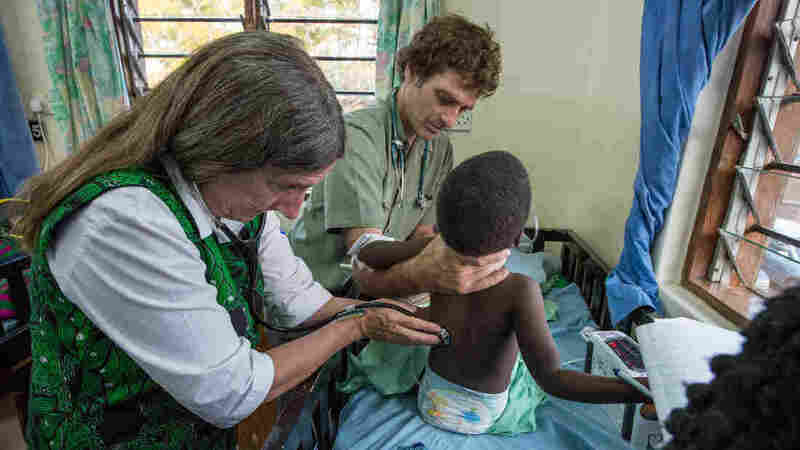 Dr. Terrie Taylor, left, and Dr. Karl Seydel take a child's vitals in the malaria ward at Queen Elizabeth Hospital in Blantyre, Malawi. Malaria is one of the oldest scourges of mankind. Yet it's been a mystery how the deadliest form of the disease kills children. One doctor in Michigan has dedicated her life to figuring that out. Now she and her team report their findings in this week's issue of the New England Journal of Medicine. The key to solving the mystery was looking inside the brain. Most of the time malaria causes a bad fever and body aches. But in rare cases — often in children — the parasite gets stuck in the capillaries of the brain. The child has a seizure, goes into a coma and can die. The effects of malaria in the brain are clear: A healthy brain, right, has many grooves and crevices. But when the brain swells up, left, these crevices smooth out. This all happens in only two or three days, says Dr. Terrie Taylor of Michigan State University. "These are bright, happy children who are suddenly felled by a disease that quickly renders them unconscious. And quickly kills them. It's a catastrophe." The sudden death of a child devastates not just the family but the whole community, Taylor says: "Imagine the ripple effects on their friends and their siblings. Suddenly their friends are gone. Just gone." Since 1986, Taylor has been treating children with severe malaria at Queen Elizabeth Central Hospital in Blantyre, Malawi. Seeing so many families deal with these huge losses, year after year, made Taylor focus her career on one goal: Figuring out why some children die from cerebral malaria but others soon recover. To do this, she realized that she needed to look inside the brain of a child suffering with malaria. And for that, she needed an MRI machine. Those cost about a $1 million. So Taylor and her colleagues went to General Electric and eventually convinced the company to donate one. 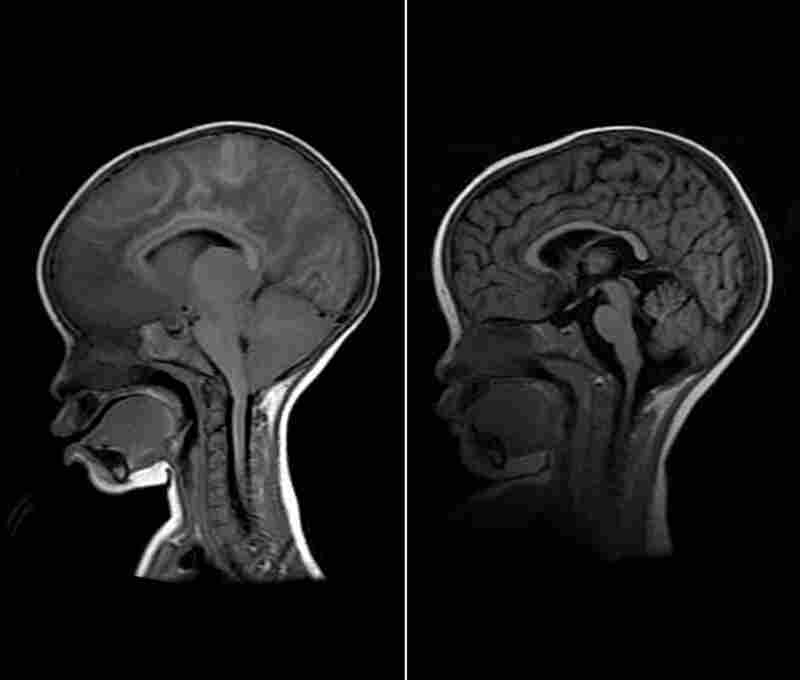 Taylor will never forget the first time they took images of a child's brain, right before the child died. "I remember just staring at the image. And thinking. Oh my goodness. Now we know. Now we know what happened." When malaria goes into the brain, it can quickly kill a child. Parents often say that their child had a fever for a few days and then suddenly went into a coma. The image showed massive swelling in the brain. At the time, researchers knew cerebral malaria could do this. They had seen it in autopsies. But what they didn't know was how that swelling caused death. The answer was clear on the MRI image: The brain was so swollen that it got pushed out of the base of the skull and pressed against the brain stem. "Unfortunately when that happens it presses on the respiratory center in the brain stem," Taylor says. "It's like flipping a light switch: Boom! They just stop breathing. And the child dies in 15 or 20 minutes without ventilation." Taylor and her team imaged the brains of about 170 children. The ones who died were much more likely to have massive brain swelling that brought pressure on the brain stem. She and her team published the study Wednesday in the New England Journal of Medicine. "It's really an extraordinary study," says Dr. Chandy John, a pediatrician at Indiana University School of Medicine, who is also on faculty at the University of Minnesota. "This type of experiment is very, very hard to do in any country in sub-Saharan Africa." John, who studies malaria in Uganda, says he's never dreamed having an MRI at the malaria ward. He says Taylor's findings are important because they point to potential therapies or interventions to test. One possibility is to try putting the child on a ventilator, John says. "Then, during a period when brain swelling might affect the child's ability to breath, you could breath for them," he says. Then take the child off the ventilator when the brain swelling goes down. Many clinics in Africa don't have ventilators or physicians trained to use them, John says. "It's going to be very hard to implement that across Africa. But I would love to see ventilators tested." And if a malaria ward in Malawi can get a million-dollar MRI machine, surely somebody could donate life-saving ventilators.